What follows are instructions for making this quilt top. I’ll explain how I made the two blocks used in this top and you can make any number of blocks you like for the size quilt that you desire. 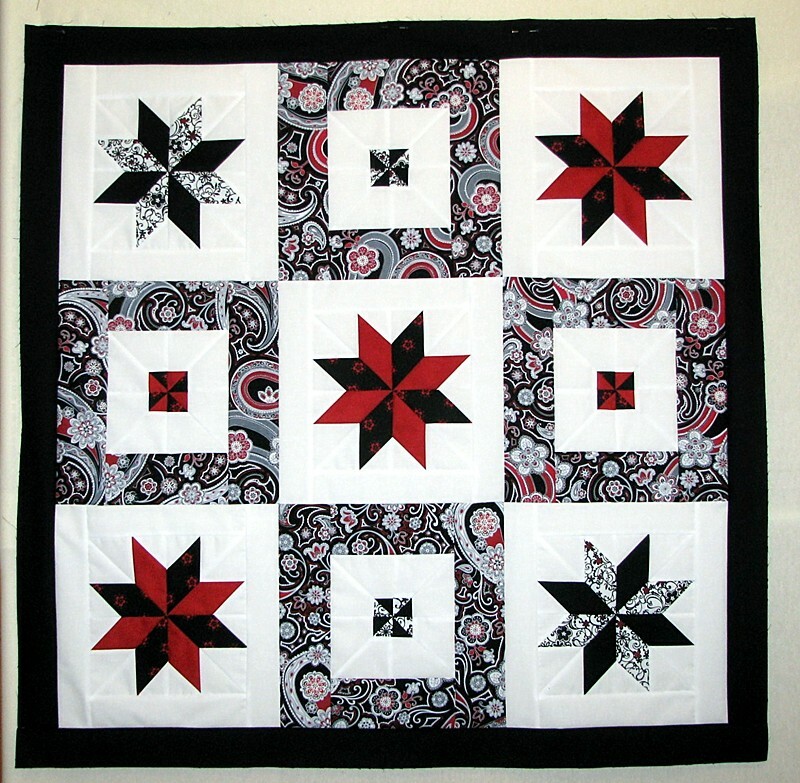 Using nine blocks plus the one outer border, this top finished at 42 1/2″ square. You will need two contrasting colors/patterns for your star points and a background fabric (I used white so the stars would really pop). I’ll refer to the fabrics for the points as “dark” and “light” in the instructions. All seams are stitched with a 1/4″ seam allowance. Step 3 – Lay one background square on the bottom of each light and dark rectangle, right sides together, then stitch on the drawn diagonal line as illustrated below. The dark rectangles and the light rectangles should have the stitched line going in the opposite direction. Step 6 – Place a background rectangle on each dark and light strip set, right sides together, and sew along the seam as pictured below. Press the seams in opposite directions as described. Step 9 – I chose to pin my two units together, holding the nested seams better, then sew on the drawn diagonal line. Because you are sewing over a couple of seams I felt this would keep it more stable. Step 10 – Draw another diagonal line 1/4″ away from your stitch line, then sew another stitch line 1/4″ away from the drawn line. Step 12 – Open the two pieces and you’ll have a block with 2 star points and a block with a section for your mini pinwheel. Press your seams towards the dark fabric on each of these blocks. If you’ve already sewn and cut all of your pieces as described above you’ll have four blocks with star points and four blocks with what looks like mini half-square triangles. Place the top right and left halves right sides together and stitch. Press the seam to the left. Place the bottom right and left halves right sides together and stitch. Press the seam to the right. Place the top and bottom units right sides together and “nest” the seams. Sew and press the seam to one side. To finish this block I added four 2 1/2″ wide strips all around the sides, sewing the right and left sides on first and then the top and bottom strips. Measure the sides of your blocks to determine the length needed for each side. Like the Star block, sew the top two blocks together and press the seam to the right, then sew the bottom two blocks together pressing the seam to the left. Join the top and bottom units together nesting the seams. I then bordered this block with fabric strips measuring 3 1/2″ wide. The Star and Pinwheel blocks each measure about 13 1/4″. I sewed my blocks together first in columns, and then each column to each other. I bordered the quilt top in black 2 1/2″ strips. I hope this tutorial helps you to make your own version of this quilt. Wow! So easy, thank you!! !